Make a difference in the fight against blood cancer. Our talented panel of blood cancer researchers – including Dr Chan Cheah – share a common passion to set up the Western Australian Lymphoma Centre of Research Excellence, a world-class centre of research and innovation to help blood cancer patients live longer, better lives. Blood cancer is the third leading cause of cancer deaths in Australia with more than 1000 Western Australians diagnosed with blood cancer (leukaemia, lymphoma and myeloma) each year. While they have access to some of the world’s finest medical care, this isn’t always enough. If current treatments are unsuccessful, a patient’s only option may be a new therapy available through a clinical trial at the cutting-edge of research. There are many new and exciting blood cancer therapies under development around the world. However, there are very few clinical trials for blood cancers available to patients in WA. Seriously ill patients seeking access to innovative therapies must travel interstate or overseas. This can cost more than $100,000 and involve strenuous travel for vulnerable patients and weeks away from family and friends. Patients with the means to do so can drain their entire superannuation to survive the cancer, but many other patients cannot afford this option. 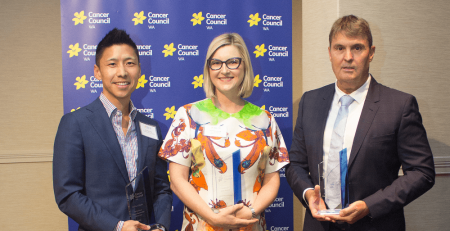 The Snowdome Foundation was established in Victoria in 2010 with a mission to accelerate new treatments to Australian blood cancer patients to help them live longer, better lives. Snowdome is now extending its focus to include WA, supporting Perth-born, internationally recognised blood cancer specialist, Dr Chan Cheah. benefit humanity by accelerating research into a cure for all blood cancers. There are no known health preventative factors, so medical research is critical to finding a cure for blood cancer. Blood cancer research learnings can also assist other cancer types. Connecting our local resources with national and in­ternational cancer centres means that WA patients will have access to the best treatment available anywhere. The hope is that what is learnt from treating patients here, will advance a cure for blood cancers and help millions around the world. Our vision is that every Western Australian with blood cancer may have access to the best care and treat­ments available. With your generous support and the hard work of leading WA doctors and philanthropists, we believe this is achievable. If you have any questions, you can speak to Suzie Bratuskins at the Snowdome Foundation on 0447 201 093 or send her an e-mail at rdm@snowdome.org.au Or you can visit our FAQs page.